Grab your veggies and meet me in the kitchen! These triple-bean veggie burgers are so full of flavor, you’ll never miss the meat! Sometimes it feels like I’ve been blogging long before blogging was even cool… So why on earth have I waited this long to post a recipe for veggie burgers?!? Gah! I’m impossible. I’m also impossibly in love with these burgers! See what I did there? Yeahhhh I’ll go sit in the corner now while you prep your kitchen. You guys seriously need to stop letting me get away with this level of cheesiness. Makes 8 jumbo veggie burgers — some to nosh now, and some to freeze for later! I mean, why do you think I made so many? I clearly needed to have enough for and even number of burgers and salads! I’m an equal opportunist eater. Or the veggie burgers are just THAT good. They’re that good. Make them. Vegan? 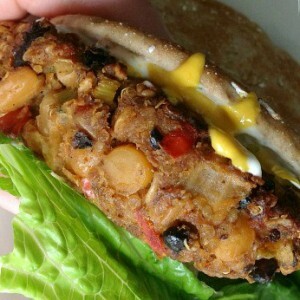 Use 2-3 flax eggs (recipe) in place of conventional eggs and you’ve got a tasty plant-based veggie burger on your hands! Woot! Gluten-Free? I gotcha! Serve these up on a lettuce wrap, on a leafy green salad, or on your favorite gluten-free bun. Anything goes! As long as you use gluten-free certified oats you’re good to go here. No GF oats handy? My Quinoa Pumpkin Burgers use quinoa in place of oats quite marvelously. T-Rex Chefs, put down the meat and make some damn veggie burgers! Pretty please? Note: These burgers hold together best when they have 30 minutes of chill time in the fridge prior to cooking. Feel free to prep them the night before! Grab your veggies and meet me in the kitchen! These triple-bean veggie burgers are so full of flavor, you'll never miss the meat! Drain and rinse beans, then set aside. Next saute celery, onion, and red pepper in approx 4 Tablespoons of oil with a few cranks of freshly ground black pepper and a sprinkle or two of red pepper flakes. Transfer to a large bowl and add the beans, flax, oats, and quinoa. The oat/quinoa ratio can vary depending on what you have on hand [think of these burgers as a great way to empty your fridge and pantry!]. I try to always have a bowl of cooked quinoa in my fridge so I can make super speedy batches of quinoa fried rice during the week..
Add the rest of your ingredients and mix. Feel free to use a large spoon or potato masher to somewhat smush everything together. Once incorporated, it will start to look like edible confetti! You can transfer this mixture to a food processor for a more uniform veggie burger or leave the beans whole for a super chunky veggie burger that will crumble easily on salads and such. I like them chunky so I've actually never pureed them in any of the batches that I've made. They whole beans give the burgers a meaty texture that makes me feel like I'm eating a traditional burger. Only they're healthier... and more flavorful... and yes, just plain awesome this way. First form the bowl-of-yumminess into balls. I can't quite say this without making it sound borderline inappropriate, but cup each ball in your hands and squeeze tightly, rotating as you gently but firmly press it into a disc. Think of it as stress-relief! Form into 8 patties, cover, and refrigerate 30 minutes. Feel free to prep these overnight for the following day! I typically make one burger right away and then leave the remainder in the fridge overnight. The following day I cook up the rest of the burgers and split the batch between the fridge and freezer. To freeze, simply cook the burgers, allow to cool a bit, and then freeze [spaced] on a plate or cookie sheet. Once they've had a chance to partially freeze you can pile them in baggies or your favorite airtight container. Viola! Fast food without the freaky ingredients. Ready to eat? Pour a teeny bit of oil in a skillet, heat to high, and cook for a few minutes on each side until you're left with a golden crust. Wrap any burgers that you don't plan on stuffing your face with immediately in foil, saran wrap, or an air tight container and pop in the fridge or freezer for a quick meal. To re-heat, simply pop on a baking sheet in the oven for about 20 minutes at 400F. This recipe yields 8 delicious veggie burgers; some to scarf now and a few to freeze for later! 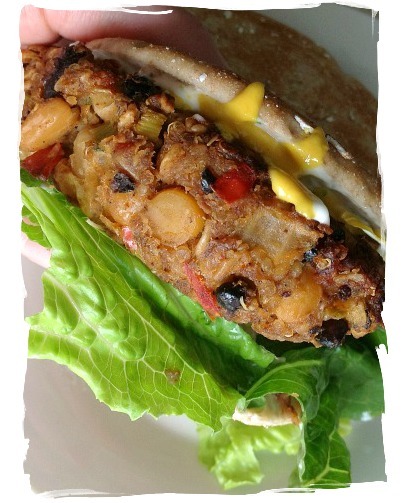 Buffalo Chickpea Veggie Burgers – READER FAVORITE! Chopped Cauliflower Broccoli Salad with Creamy Avocado Dressing – makes a great side dish! 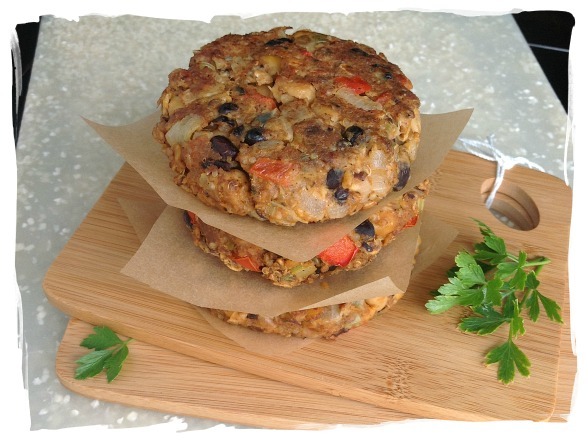 If you get a chance to try these triple bean veggie burgers, let me know! I’m a US transplant living in Ireland and these are super with melted Dubliner Cheese and avocado. Granted, so is everything, but that whole burger made my night. And I’m glad you like TK 😀 Gotta spread the food love. These look absolutely amazing! I am going to make them tonight – can’t wait. I’ve long been anguished and dismayed by frozen veggie burgers, too, and many of the recipes I’ve found online look either ho-hum or too dry. These are so colorful! Absolutely! I’ve used Panko and loved it! This looks amazing..I’m going to try these out! Only thing is, any substitute for the cannellini beans? Oh I have been looking for a good veggie burger. I’m going to try these this weekend. thanks for the recipe! I am on my second batch. This how to be my favorite. LOVE IT!!!!!!! Hey Sandi!!! I am such a goober I need to update the post! So glad you caught my good! I’m just like you and winging with a few cloves. I added two onto this particular batch 🙂 hope you love them!!! They are one of my absolute favorites! Soooo… somewhere in the directions, it mentions garlic, but I don’t see garlic on the ingredient list. Knowing me, I would just toss a few cloves cause I love me some garlic, but just wondering how much you usually do or would recommend? I can’t wait to make these on Monday!! hehe glad they were a hit!!!! I can’t stop making them! I made these this weekend and they are delicious! The son and hubs both liked them, however; the hubs has asked next time I use the food processor instead of my hands. LOL. Thanks for such a great recipe. This is perfect!! I’ve been wanting to make homemade veggie burgers. I made those burger (or kind of because I did not have all the ingredients, so I substituted) and they were good! No food processor at my mum’s place (vacation 🙂 ), so I used my hand so mix everything and get some kind of a paste. I can’t wait to try those at home. Yay! Thanks Tatiana! I hand mixed mine too (with a little “gentle” mashing from a large wooden spoon!) and I loved the texture of them that way!!! I’ll probably never end up using a food processor — one less thing to clean! Whoohoo! I’m new here and I have to say, your recipes look SO yummy! I can’t wait to try some of them, especially this burger recipe. I can’t wait to read more! Love the T-Rex version of this one…I agree. These look amazing! Oh my these look fantastic! I’ve only tried 2 veggie burger recipes in my life that have actually held together and worked out taste-wise. Most end up not being moist enough, but yours look great in that regard! Will definitely have to try them! Yum. I love veggie burgers. What can i sub for the quinoa? hi hi hi! my stomach is officially in growling mode after having viewed this delicious post! nom nom nom! I’m going to be making them with yellow pepper for the celery! Looking forward to the deliciousness! All bean burgers ive tried are either too dry or mushy and don’t stay together. I jsut bought a bunch of beans today so i may try these this week, thanks! yummm. can’t wait to try these babies out! Love me a veggie burger- traditional style…but on the salad…mmm that looks like a nice alternative. I can also imagine these a la Mexi-style such as in a quesadilla or taco. Yumito! These look AMAZING! I’m especially loving all the fiber-licious beans and flavor combinations. Yum! These look and sound delish! I usually buy my veggie burgers from the store, or order them out at restaurants all the time, but I’ve actually never tried making my own. This sounds like a great place to start-love how hearty they look! Yum! These looks awesome. Our favorite burger bar down the street has black bean burgers that are held together with falafel…uuuuum….pretty much one of my favorite burgers ever! those look .SO. GOOD!! love all the veggies and colors! Wow, these look filling! You’re definitely not compromising on the protein here. YUM! Those look SO GOOD. They just look so fresh and yummy! Much better looking than the frozen veggie patties I buy normally. Thanks for sharing this! I don’t know if I ever told you this, but I went through a phase in college where I ate a veggie burger every night for over a month in college. Yep, and I’m not even a vegetarian. I have to say though, these look WAYYY better than the frozen patties I bought at the grocery store. Now, I just need to find time in my day to grocery shop and cook. Eh who am I kidding, I’d rather watch Real Housewives. Can you just come over? YUM! I just made some garlic quinoa burgers on Saturday and they were so good! ahhh I need to clairfy that in the recipe! Thanks Laura!!! The additional ground flax in the recipe acts like breadcrumbs would in a typical burger recipe. The flax eggs would be separate if you were going to make them and use instead of eggs. I typically just use the eggs b/c I always need the extra protein. Do you need 2 eggs and 2 T flax, or just 2 eggs or 2 flax eggs? Wow 3 beans, veggies, quinoa, and oats in one burger? Sounds perfect! One question though I do not like celerly is there anything I can replace it with? Drooling. I kind of like that they make so many! 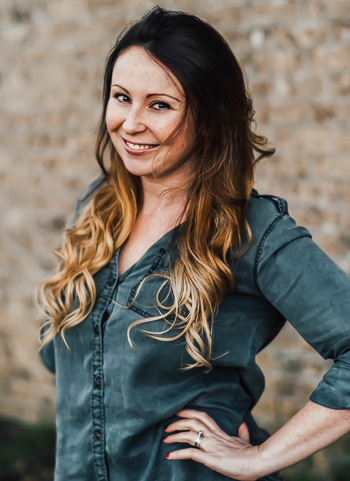 I live alone, so I’m always looking for super easy recipes that I can nosh on for a few days! These look so nice and hearty! I love putting black beans in burgers to cut the fat a little. However, my current roomie has a massive distaste for beans (texture thing). Sadness. These look SOOOOO yummy :)))) I definitely pinned! These look so good! Love the idea of putting them over a salad. WOW those look good. I love when you can actually see the VEGs in VEGGIE burgers. A: you know I’m making this. B: you know when I started blogging? 2006. Before that, I had a gurlpage and a poetry page. Maybe I AM a hipster…..shudder. I have been going through a veggie burger kick this summer. I can’t get enough of them. These look great!